It’s not just Gabe, who is diagnosed with autism, who benefitted from the celebration but folks on both sides: Those in similar situations who suffer from the same alienation and those who lent a hand and a heart to be there in support of the families. Included are the individual attendees as well as the numerous benefactors who donated time, services, and money to make these kids feel so special. Awareness of this Cherab Foundation community birthday celebration reached the Roanoke Rail Yard who was so touched by Gabe’s and the other children’s stories they donated tickets to the hockey game as well as special recognition during the game. “We are extremely excited and grateful for the assistance, bringing the community out while fostering acceptance,” said Stephanie Manus, Gabe’s mom. “There are lots of other kids who are bullied, or excluded, who don’t have anyone show up for their birthday party.” This morale wove its way through the three-hour celebration which left many saying it was the best birthday party they ever attended. People came because of the message; that it’s ok to be different, that people care and that you are not alone. Local news media outlets ABC, CBS, Fox and NBC all helped spread the word and as result messages and cards from the around the country poured in sharing in the sentiment of the event, either expressing support or sharing their own family’s story. It appears Gabe, Landon, Peyton, Matt, and James all have a bright new world around them, filled with friends and invitations to upcoming parties. Thanks to Cherab Foundation, their wish for friends came true! Mountain Grille who donated enough hotdogs and soda for all those who attended and opened up their full menu for purchase. Special thanks to Ralph Stewart and Josh Boggs of Now, Then, and Forever Collectables who collaborated with the Cherab Foundation for our crowdFunnit Events, to gift a large box of collectible Hot Wheels to Gabe, Landon, Peyton, Matt, James as well as Parker who was unable to attend due to his epilepsy. While the Cherab Foundation throws a birthday party for a child that is bullied or alienated, it’s not about one person, it’s about fostering acceptance and compassion for all people who feel alienated and bullied; educating, supporting and excepting our differences. Due to interest and demand, more events are currently being planned in Virginia, Iowa, and Florida. Please visit us at: Facebook page and website. We appreciate any donations to help with our mission. As a grassroots, 100 percent volunteer 501(c)3 all donations go directly to our initiatives of providing evidence-based and integrative approaches to help our special children with therapy, nutrition, socialization, and awareness. 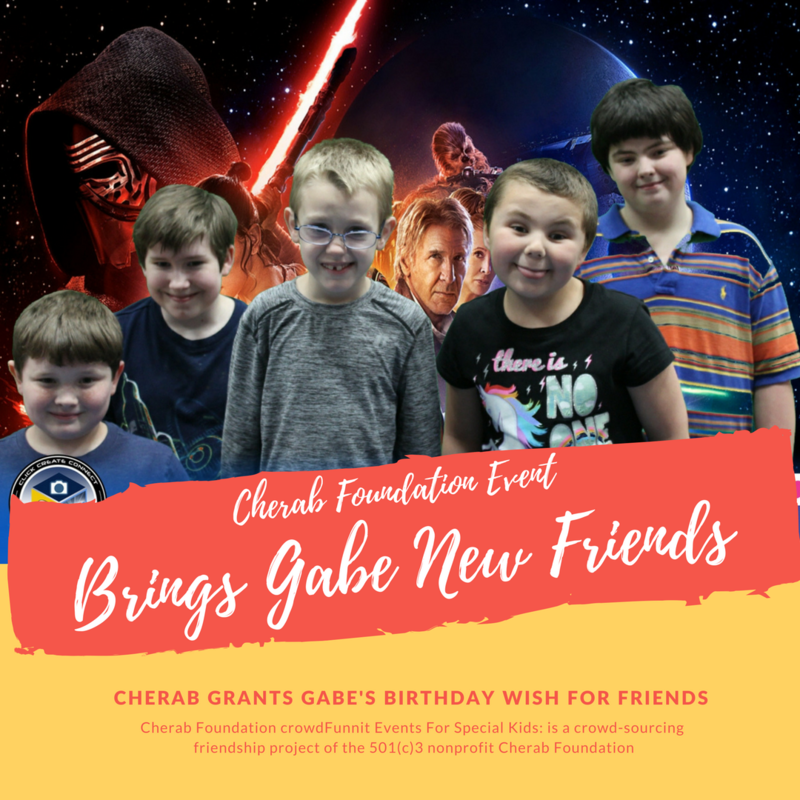 Cherab Foundation crowdFunnit Events For Special Kids: is a crowd-sourcing friendship project of the 501(c)3 nonprofit Cherab Foundation created to bring people together, raising awareness about differences while fostering acceptance and compassion. Helping a friendless child celebrate a birthday is just an incredible mechanism in which to help make this happen. The party itself and any media attention it brings will help fight bullying at the root while the community connections will exist long after the party ends.